(Conductor, Piano) Broadway: The Gershwins’ PORGY AND BESS, THE SCOTTSBORO BOYS, AVENUE Q, 42ND STREET (Revival), WICKED, CHICAGO, THE PAJAMA GAME (Revival), GYPSY (2003 and 2008 Revivals), THE PRODUCERS, WHITE CHRISTMAS. Off-Broadway: INNER VOICES (“Borrowed Dust”), THE SCOTTSBORO BOYS, JACQUES BREL..., THE FANTASTICKS. Regional: SENSE AND SENSIBILITY (Denver Center), FIRST YOU DREAM (Kennedy Center/Signature Theatre), THE SCOTTSBORO BOYS (Guthrie). 1st National/LA: WICKED. TV: “The Colbert Report”, “The View”, “The Rosie Show”, “The Tonight Show with Jay Leno”. Various Film soundtracks. Original cast albums: The Gershwins’ Porgy and Bess, The Scottsboro Boys, Noel and Cole. 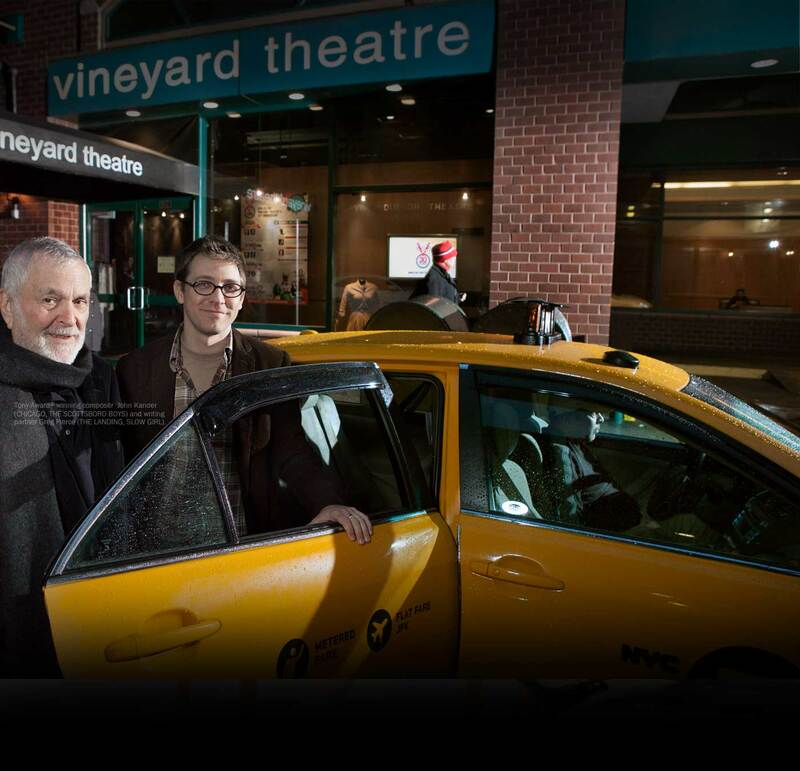 Concert performances at: Avery Fisher Hall, Merkin Hall, Alice Tully Hall, Joe’s Pub, 54 Below. BFA from New York University. (Andy Wright) Off-Broadway: THE SCOTTSBORO BOYS (Vineyard Theatre), THE TIN PAN ALLEY RAG (Roundabout); G&S CANON (City Center). National tours include RENT and FOREVER SWING. Regional credits: INTO THE WOODS, LITTLE SHOP OF HORRORS, and MACBETH (Great Lakes Theater Festival/ Idaho Shakespeare Festival); ABYSSINIA (Goodspeed), JESUS CHRIST SUPERSTAR (North Shore); RAGTIME (Paper Mill Playhouse); HAIR (Hangar Theater); SIDE SHOW (Cleveland Playhouse); THE BUDDY HOLLY STORY (Westchester Broadway); PACIFIC OVERTURES (Arden Theatre); OKLAHOMA!, BRIGADOON, RAGTIME, JESUS CHRIST SUPERSTAR, DAMN YANKEES, WIZARD OF OZ and FOOTLOOSE (Sacramento Music Circus); A LITTLE NIGHT MUSIC, ONCE ON THIS ISLAND (Connecticut Repertory); SMOKEY JOE’S CAFÉ (Actors Playhouse). (Haywood Patterson) Broadway: THE SCOTTSBORO BOYS, THE COLOR PURPLE (Harpo, Tony Nomination), City Center Encores! HOUSE OF FLOWERS (Royal), THE LION KING Cheetah National Tour (Adult Simba, Original). Regional: RAY CHARLES LIVE! (Ray Charles, Ovation Nomination), GUYS AND DOLLS, ROMEO AND JULIET, HOW TO SUCCEED…, Columbia University’s 107th Annual Varsity Show. TV: “Quincy Jones’s America’s Millennium”, ABC’s “OLTL” (Darryl), “L&O: Criminal Intent” (Dix). Awards: Columbia University’s I.A.L. Diamond Award, NFAA First Level, British Academy of Dramatic Acting scholarship, Presidential Scholar Semi-Finalist. Brandon, a Columbia University graduate, thanks family, Jack Waddell, and Abrams Artists/Noble Talent Management for their continuous belief in him. BrandonVictorDixon.com, Findingmorganfreeman.com. (Willie Roberson/Electrofied Charlie) Off-Broadway:THE SCOTTSBORO BOYS (Vineyard Theatre), STAIRWAY TO PARADISE (City Center Encores!). Regional: BUBBLIN’ BROWN SUGAR (Fox Theatre, Atlanta). Other theatre credits include LOOKING FOR JOSEPHINE (Opera Comique, Paris), Barack on Broadway (New Amsterdam Theatre), Broadway By the Year and All Singin’ All Dancin’ (Town Hall NYC). Trained at NYU Tisch School’s ETW. www.myspace.com/TAPKID257. 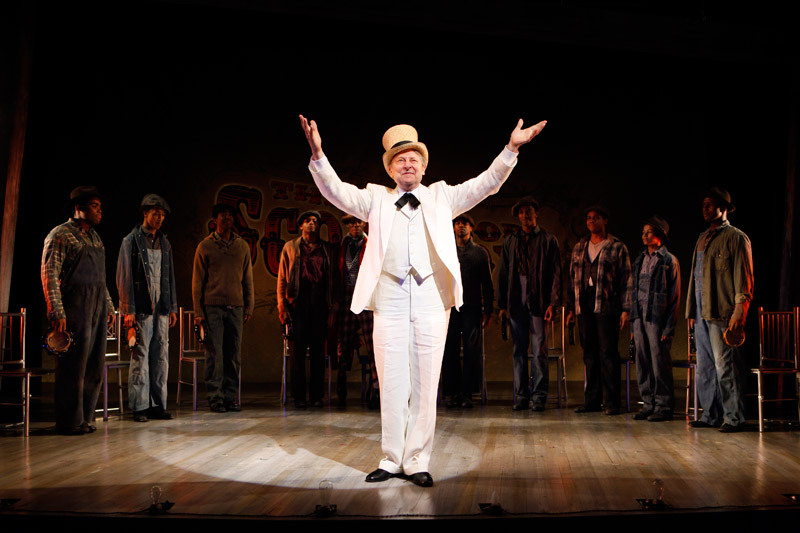 (Mr.Tambo/Samuel Leibowitz) Broadway: THE SCOTTSBORO BOYS (Tony Award Nomination). 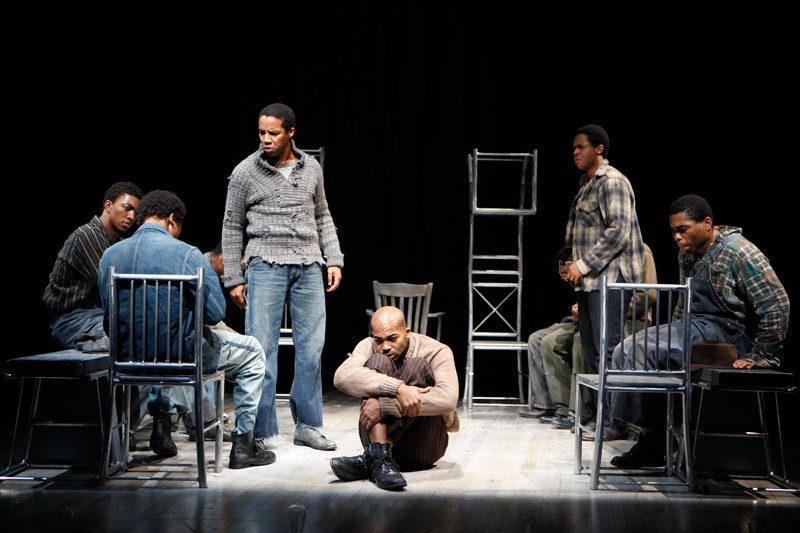 Off-Broadway: JAMES BALDWIN: A SOUL ON FIRE (New Federal Theatre, Audelco Award Nomination). Regional: AVENUE X (11th Hour Theatre Company, Barrymore Award), SIZWE BANSI IS DEAD (Lantern Theatre Company), THE THREEPENNY OPERA (Wilma Theater, Barrymore Award Nomination), THE AMERICA PLAY (Zachary Scott Theatre, Central Texas Critics Table Award), JULIUS CAESAR (People’s Light and Theatre Company), A CHRISTMAS CAROL (Westport Country Playhouse), DREAMGIRLS (Prince Music Theater), FINIAN’S RAINBOW (Walnut Street Theatre). Trained at the University of Connecticut. 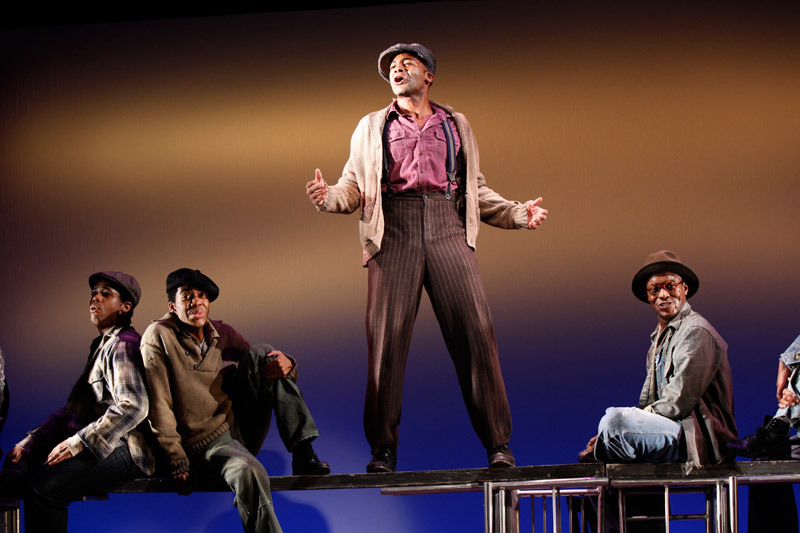 (Roy Wright/Electrofied Issac/Billy/Cook) Off-Broadway Debut in THE SCOTTSBORO BOYS and thrilled! National Tours: XANADU (Terpsicore/Young Danny, 1st Nat’l), 25TH ANNUAL PUTNAM COUNTY SPELLING BEE (Mitch/Chip/Panch U/S, 1st Nat’l), RADIO CITY CHRISTMAS SPECTACULAR (Soloist, Arena Tour). NYC Theatre: BONNIE & CLYDE (Buford, NYMF), DIAL ‘N’ FOR NEGRESS (Antonio, Theatre Row). Regional Theatre: AIDA (Mereb, Lyric Theatre, OK), DREAMGIRLS (C.C. White, WVPT), FIVE GUYS NAMED MOE (No Moe/Lil’ Moe, Lyric Theatre, OK), JOSEPH AND THE AMAZING TECHNICOLOR DREAMCOAT (Calypso Brother, Music Theatre Wichita). BFA from Wichita State University. Thanks to this incredible team for taking a chance on me. Thundercats Ho! www.JuliusThomas3.com. (Charles Weems/Victoria Price) Praise be to God! Favorite roles: THE SCOTTSBORO BOYS (Vineyard Theatre), THE WIZ starring Ashanti (Scarecrow, City Center Summer Stars), JERSEY BOYS (Barry Belson, Vegas), HAIRSPRAY (Seaweed J. Stubbs, Tour and The Muny). 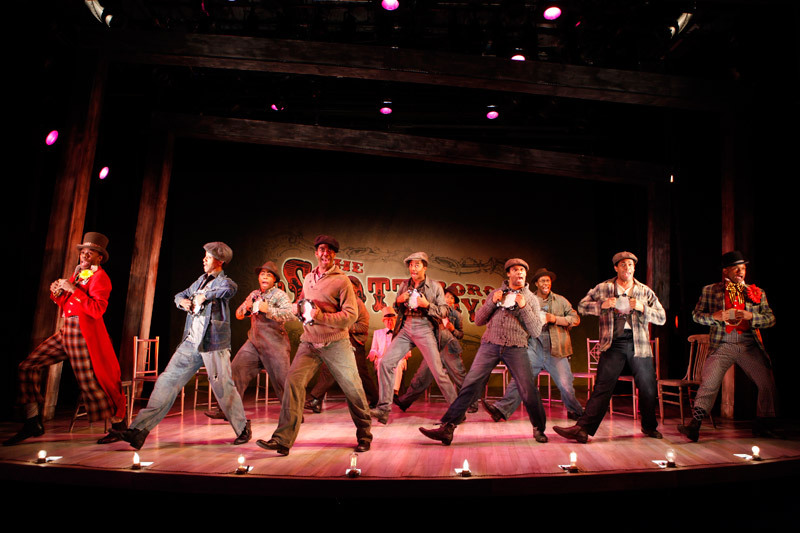 Reading: THE SCOTTSBORO BOYS directed by Susan Stroman, music and lyrics by Kander and Ebb. Love you Mom, Grandma, Bookie, Shamicka, J. Jones, T. Lavell, Larry, Carnahan Casting, Erica Bines, and Headline Talent. 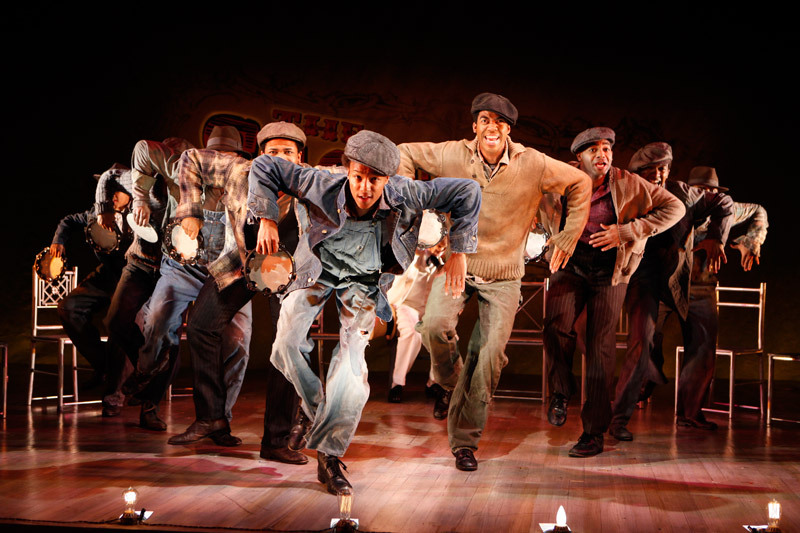 (Eugene Williams/Little George) Off-Broadway: THE SCOTTSBORO BOYS (Vineyard Theatre). Favorite Credits: THE LION KING (Young Simba), THE NUTCRAKCER (Fritz), THE WIZARD OF OZ, DAMN YANKEES. He has also appeared on “Sesame Street”, “The Electric Company”, and the music video for “Heard ‘Em Say” with Kanye West. He is an 8th grade honors student at the Philadelphia Performing Arts Charter School. He is currently working on his first CD project and is honored and excited to be performing in THE SCOTTSBORO BOYS. www.CodyWise.com. 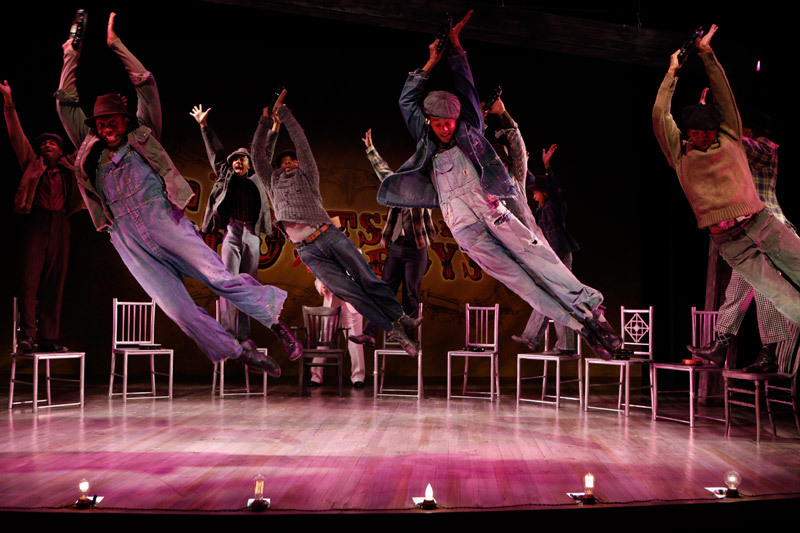 Derrick Cobey, Julius Thomas III, Brandon Victor Dixon, and Josh Breckenridge in THE SCOTTSBORO BOYS. 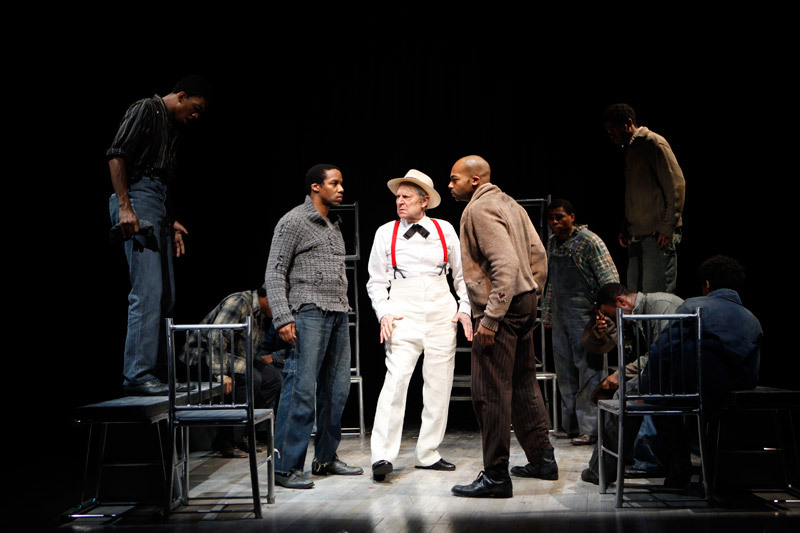 John Cullum and company in THE SCOTTSBORO BOYS. Photo by Carol Rosegg. Colman Domingo and Forrest McClendon in THE SCOTTSBORO BOYS. Photo by Carol Rosegg. 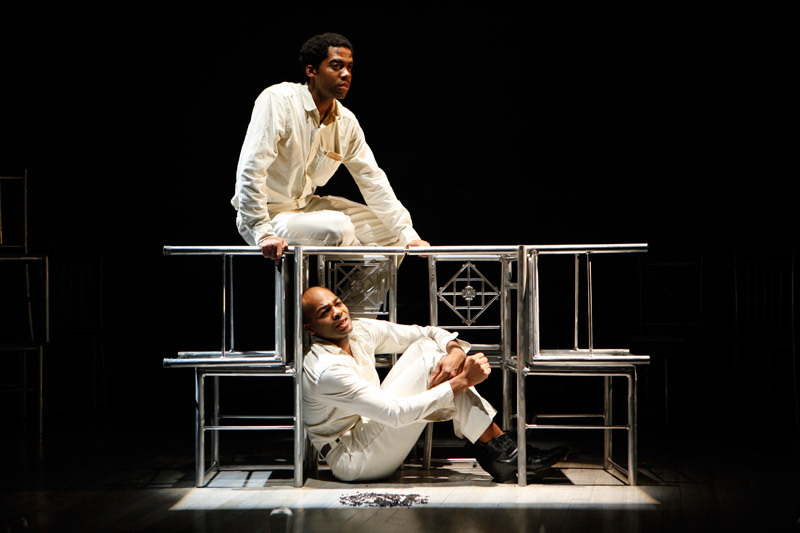 Brandon Victor Dixon and Julius Thomas III in THE SCOTTSBORO BOYS. Photo by Carol Rosegg. 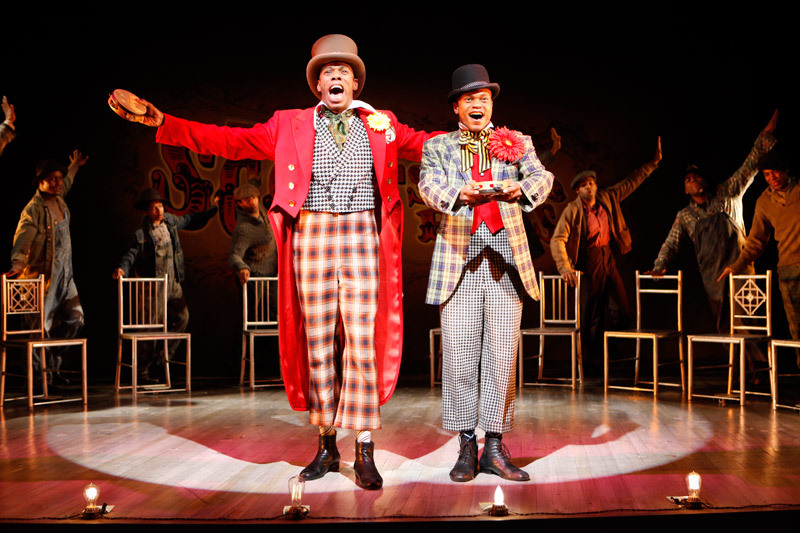 Julius Thomas III and Brandon Victor Dixon in THE SCOTTSBORO BOYS. Photo by Carol Rosegg. Susan Stroman is in her top form here - the company of actors is extraordinary, with RAZOR SHARP DANCING, AND SOARING MUSIC, SOME OF KANDER AND EBB'S BEST!" "DAZZLINGLY ENTERTAINING! HURRY UP AND GET TICKETS!" 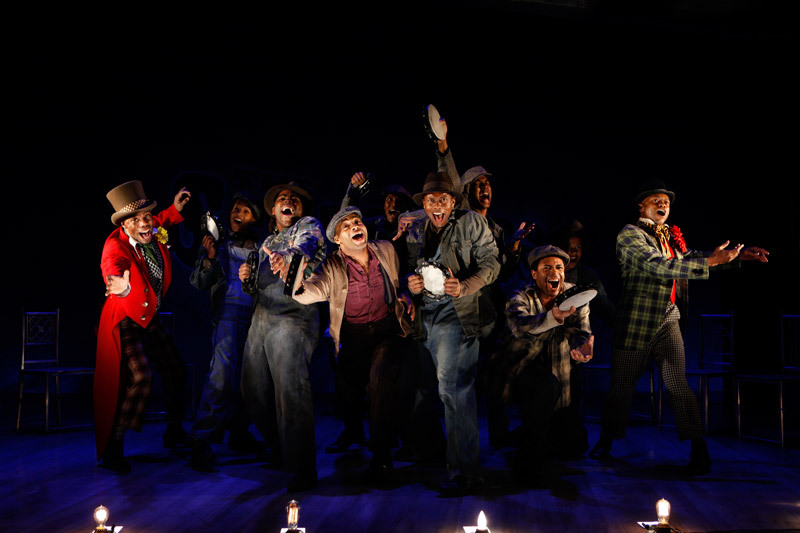 The Scottsboro Boys, the acclaimed new John Kander and Fred Ebb musical that takes a flashpoint in American Civil Rights history and makes it sing, dance and sting Off-Broadway at the Vineyard Theatre, will not transfer to Broadway this season, according to the New York Times. 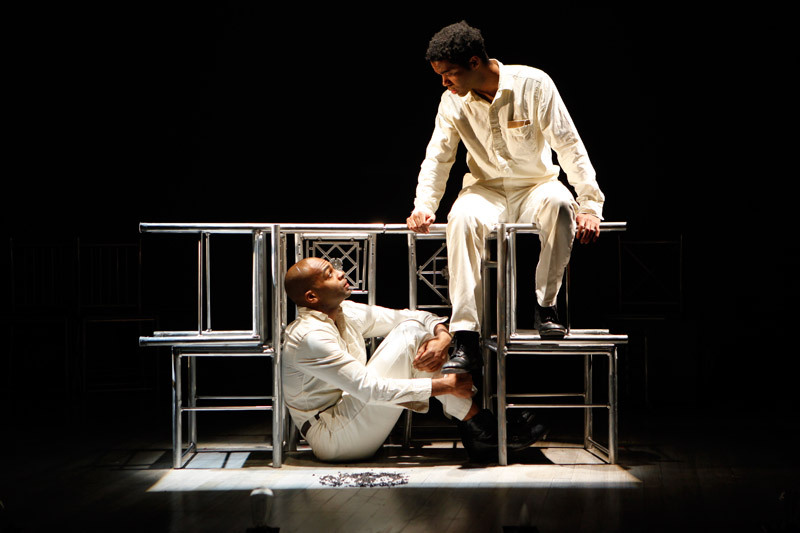 VINEYARD THEATRE AND BARNES & NOBLE BOOKSELLERS TO PRESENT PANEL DISCUSSION "THE SCOTTSBORO BOYS: A CONVERSATION ABOUT THE CASE AND ITS LEGACY"